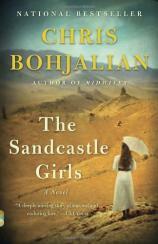 THE SANDCASTLE GIRLS, Chris Bohjalian’s latest novel, follows Elizabeth Endicott, a wealthy, college-educated American woman as she tries to aid victims of the Armenian genocide, and meets a man who winds up falling in love with her. The story picks up in the present day with Laura Petrosian, who, after viewing a photo exhibit of Armenian refugees (some of whom have her last name) embarks on a journey to reconnect with her roots. In this interview, conducted by Bookreporter.com's Usha Rao, Bohjalian talks about the warmth of Armenians, the challenges of writing across gender, and how the world came to forget the Armenian genocide. Bookreporter.com: How does your own Armenian heritage inform the plot and tone of THE SANDCASTLE GIRLS? Is this a story you’ve had in you for many years, or were you more recently inspired to tell this particular tale? Chris Bohjalian: I had been contemplating a novel about the Genocide for most of my adult life. I actually tried to write one in the early 1990s, between WATER WITCHES and MIDWIVES. But it was a train wreck of a book. I’m not kidding. It was unbelievably amateurish. In 2009, my Armenian father grew ill. He lived in South Florida and I live in Vermont. When I would visit him, we would pore over old family photos together, and I pressed him for details about his parents --- who were Survivors from western Turkey. I also asked him for stories from his childhood; after all, he was the son of immigrants who spoke a language that can only be called exotic in Westchester County in the 1930s. Finally, a good friend of mine who is a journalist and Genocide scholar urged me to try once again to write a novel about what is, clearly, the most important part of my family’s history. His name is Khatchig Mouradian, and in a way he is this novel’s godfather. So I did try again. And this time, the story came together. BRC: Did you visit Armenia as part of your research? What are your impressions of the country? CB: I didn’t visit Armenia as part of the research. I tried like heck to get to Syria while I was writing the novel --- much of the novel is set in Aleppo and Der-el-Zor --- but it was too unstable and the State Department urged against my going there. But I was in Armenia earlier this year. And I was very, very happy there. My hotel in Yerevan was on Abovyan Street, and it intersected two blocks away with Aram Street. This was a great gift: Abovyan was the first modern Armenian novelist, and Aram was my father’s name. He passed away last year, and his death made my journey to Armenia all the more important to me. And to see his name intersecting with a great Armenian novelist was a wondrous and unexpected blessing. Obviously, like many post-Soviet nations, Armenia has a host of monumental economic hurdles --- and those hurdles are exacerbated by its place in the Caucasus region. But, my Lord, is it beautiful. And I have never been better cared for and felt less like a stranger in a strange land. BRC: It is surprising to learn that the Armenian genocide was a well-known event at the time of its occurrence, with newspapers across the globe reporting the massacre of Armenians at the hands of the Ottoman Empire. However, this genocide has been largely forgotten outside of the Armenian diaspora. Why do think it is that most of us are unaware of a genocide that wiped out nearly 1.5 million people --- three fourths of the Armenian community at the time? CB: I think there are a variety of reasons for this: A principal one is that the post-War Ataturk Government wanted to be perceived as a modern, western democracy. It didn't want to be saddled with the sort of barbarism that was involved with what Raphael Lemkin christened "genocide." And while news cycles moved more slowly in the 1920s than they do now, they did move. And people's memories are short. Moreover, there are two differences between the Armenian Genocide and the Holocaust. First, the Holocaust occurred smack in the middle of Western Europe and the Ukraine. You can't murder six million people from the Seine to the Volga without a lot of witnesses. The Armenians were slaughtered in eastern Turkey and the Syrian desert. As my fictional narrator asks rhetorically in THE SANDCASTLE GIRLS, "How do you kill a million and a half people with nobody knowing? You kill them in the middle of nowhere." Second, there is the issue of recognition. A few years ago, I heard the incredibly inspiring Gerda Weissmann Klein speak at the University of Texas Hillel. Gerda is a Holocaust Survivor and author of (among other books) ALL BUT MY LIFE. Someone asked her, “What do you say to people who deny the Holocaust?" She shrugged and said simply, “I tell them to ask Germany what happened. Germany doesn’t deny it." As Armenians, we have a Genocide in which fully three-quarters of the Armenians living in the Ottoman Empire were killed, and yet it remains unrecognized by Turkey and its allies. I think that’s why we are hungry for novels that tell our story --- and that tell the world what our ancestors endured a century ago. BRC: Elizabeth Endicott, the Boston Brahmin protagonist of THE SANDCASTLE GIRLS, finds love in Aleppo during World War I, but she also learns a terrible secret that she carries to the grave with her. What makes her decide to bear the burden of this secret by herself rather than share it with her lover, Armen? CB: I am going to be careful how I answer because even this question is a spoiler. My response could be downright ruinous! But my sense is that Elizabeth understands there is nothing Armen can do to change anything. And so, after all he has lost and all he has endured, she chooses to shoulder the secret alone. BRC: In the novel, a couple of German soldiers take photographs of Armenian refugee women and children in secret, which are then passed from the Germans to several others before finally making their way into public view. Did you base this story on fact? Who took and circulated the photos of Armenian refugees now available to us? CB: My two German soldiers --- military engineers --- were inspired by a German named Armin Wegner. Wegner was an Iron Cross-decorated nurse who was sent to the Middle East in 1915.That summer he ignored the Turkish Government’s strict orders about sharing word of the “deportations” and “extermination,” and took photographs and interviewed survivors. At one point, he hid photographic plates in his belt to get them safely out of the Ottoman Empire. BRC: Some of the descriptions of the dead and dying women and children in the so-called refugee camps are haunting and heartbreaking. Were these scenes particularly difficult to write? Has there been a lasting impact of writing this novel on you? CB: I know in my heart, this is the most important book I’ll ever write. That was clear to me often when I was writing it --- and, yes, especially when I was researching and writing about the refugee camps. BRC: An integral part of any genocide is the callous disregard for other people’s humanity. I am curious to learn if researching and writing this book has given any special insight into genocide. Do you think there are specific cultural and other factors that predispose people to commit such atrocities? CB: One of the things I learned from the work of Turkish scholar Taner Akcam --- who writes eloquently about the Armenian Genocide --- is that a genocide is gradual. It doesn’t begin overnight. It is a series of steady degradations and escalations. A group or a race of people doesn’t suddenly become less than human. It takes time. And then, once it starts and large parts of a nation are complicit, it can become difficult to rein in. BRC: Most of the central characters in the story are female. Are there any special challenges to writing from a female perspective as a male author? CB: I love writing across gender: I think women are a lot more interesting than men. Still, I tend to begin with the universalities: What links us as people rather than what distinguishes us by gender. Then I layer in the more specific and idiosyncratic gender details. BRC: Which character was the most difficult for you to write about or perhaps to have living in your head? CB: Hatoun and Shoushan. I really worried about the children in this novel. I’m a father, and I worried constantly when those two girls were wandering the streets of Aleppo. BRC: What has been the reaction so far from the Armenian and Turkish communities to THE SANDCASTLE GIRLS? CB: The early reaction has been very reassuring. But ask me in a month. BRC: The centennial of the 1915 massacre is coming up. Is there anything you expect or hope to see in acknowledgment of the Armenian genocide from the international community or from the Turkish government? CB: Well, recognition by the Turkish government would certainly be nice. It would also be encouraging to see a sitting American President acknowledge what happened and use that dreaded G-word. Seriously, what does realpolitik get us with this issue? What does realpolitik ever get us? BRC: Most of your other works are set in Vermont, where you live. Do you see another book about Armenia in your future? What are you working on at the moment? CB: My next book is set in Florence, Italy. But I am confident there is another Armenian novel in my future. I really am.